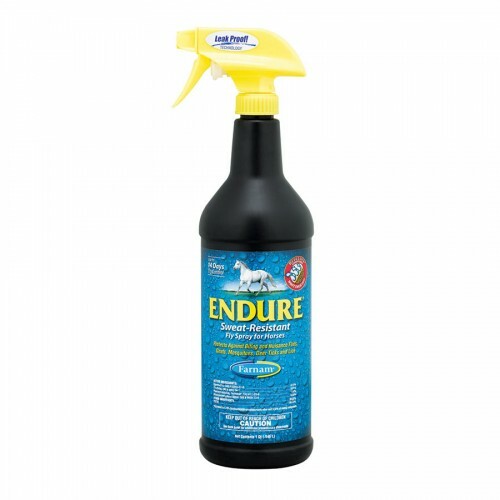 Endure Sweat-Resistant Fly Spray works to control flies, mosquitoes and other pests, including ticks, for up to 14 days. The exclusive RepeLock® conditioner binds to the hair shaft for powerful results through sweat, rain and more. Added sunscreen helps to protect your horse from all the elements. Available in a 32 oz. leak-proof trigger spray bottle. Thoroughly brush the horse's coat prior to application to remove loose dirt and debris. For dirty horses, shampoo and rinse thoroughly. Wait until coat is completely dry before applying Farnam Endure Sweat-Resistant Fly Spray for Horses. Its unique water resistant formula contains a special conditioner that binds to the hair shaft so it keeps working even in moist conditions or when the horse sweats. 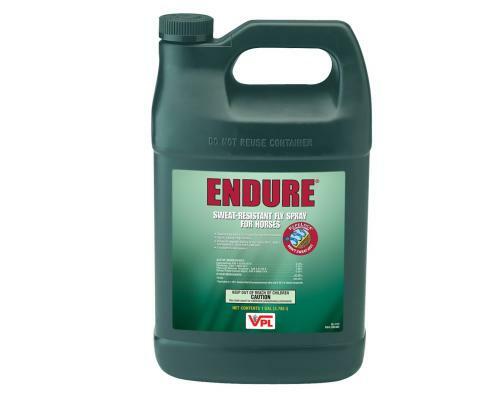 Endure Fly Spray may be applied either as a spray or as a wipe. For horse's face, always apply as a wipe using a piece of clean, absorbent cloth, toweling (Turkish) or sponge. Wear rubber glove or mitt when applying as a wipe. Spray or wipe horse's entire body while brushing against the lay of the coat to ensure adequate coverage. Avoid getting spray into horse's eyes, nose or mouth.